Notice the light spots behind the boat, and off to the left? These color changes are due to bottom composition, and recognizing them is part of learning to read the water. Being able to read the water isn’t just important for fishermen, it’s an important talent for all boaters. It can help you avoid running aground, lose speed due to currents, or anchor in an inappropriate area. Oh yeah, and then there is that fish-catching thing. Just in case there are a few of you out there who aren’t familiar with the term “reading the water,” it refers to the ability to tell—with a glance—what the water is doing in any specific area. Sounds like a tall order? Here are five tips that make it possible. 1. Color changes count – Dark patches of water may be submerged weedbeds or deep holes; color changes my show you where a tributary mixes with a bigger body of water, and light patches may be sandbars or oyster reefs. 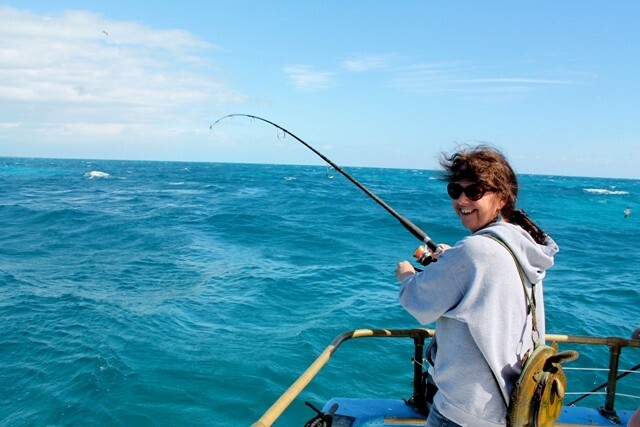 Savvy captains are constantly paying attention to the color of the water’s surface, as are anglers on the prowl. 2. Look for rips – Rips, which essentially look like a series of small standing waves that stay in the same place, form wherever two currents clash, or the current makes an abrupt change in direction due to an obstruction. If you’re an angler, you almost certainly already know this, and spend a lot of time in places where you find rips. However, in bays and rivers they can also indicate the presence of shoals, rocks, or other changes in the bottom which could present a hazard to navigation. 3. Breaking waves indicate danger – Whether it’s a boat wave you see, or rollers coming in off the ocean, when waves start breaking you know there’s a shoal underneath. And shallow spots like these present a significant hazard; run aground where waves regularly break, and they usually begin breaking right into your boat. 4. Pay attention to bends in creeks and rivers – Where a creek or takes a bend of more than 90-degrees, the outside of that band will almost always have a hole scoured out by the currents. Stay to the outside, to ensure deep water under your keel. Remember, however, that the channel rarely hugs that same shoreline after you exit that bend. 5. Consider the shoreline – One of the best indicators of what a lake, river, or bay’s bottom does is the closest shoreline. If you see a point sticking out, chances are a shallow point continues for some distance underwater. Cliffs and steep hills likely abut very sharp drop-offs, and commonly mean easy access to deep water. And ravines in the shore are also likely to continue under the water’s surface.